PV charge controller is a smart PV controller designed for large off-grid PV power system. It can manage battery to charge and discharge by controlling multiway of solar cells. And also automatically control solar cell cut or connect ordinally according to the change of battery voltage.This controller makes a full advantage of solar cell resource and also keep battery safe and reliable. To meet different power stations’ need, there are 12V,24V,48V,96V,120V,240V,360V and other normal series voltage level base on different battery voltage of off-grid PV power station system project. Wind and Solar hybrid generation is quite advanced renewable energy system presently. Really, continue achieving green power to utilize for our word day and night. The charge controller is used to manage power from wind-turbine and solar panel into accumulator battery intelligently and transfer automatically. To meet different power stations’ need, there are 12V,24V,48V,96V,120V,240V,360V and other normal series voltage level base on different battery voltage of off-grid PV and Wind power station system project. 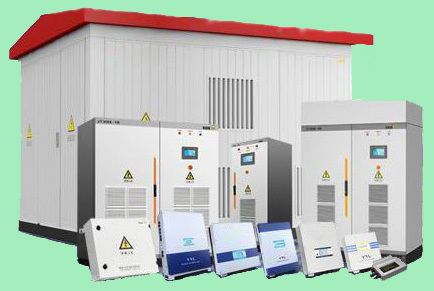 The kind of inverter is specialized designed for solar power system, which has unique appearance, specialized features and wide application. We adopt micro programming chip of 16 digits from INTEL company in USA, imported PCB in main circuit。They are all high reliability, full protection function, low THD, low price. Efficiency can be over 88%.Meanwhile they have strong load drive power of nonlinearity. Able to monitor input /output voltage and current. the inveter is for 200W to 100KW solar stations.